Going again back in time, to Purim 2013. Purim is kind of like the Jewish Halloween. We celebrate it around February-March every year, and like Halloween, it also involves costumes and candies... So two weeks before Purim, I realized the holiday is almost here, and we still haven't decided on costumes for the kids (and I have 3 kids this year!). Me (trying to cooperate): "Wow, that's a great idea... But how exactly are we going to do it?..." Big-Boy: "What's the problem? We'll just glue some leaves and flowers"
So it wasn't as difficult as I thought it would be. I used a hot glue gun to glue felt flowers and leaves to green clothes, then sewed lightly a few stuffed animals. Together with necklaces made of punched flowers and butterflies and floral head garland we created a look of a real nature son, although he still had to explain it to everyone (lead guesses - Jungle Boy, tree and forest). 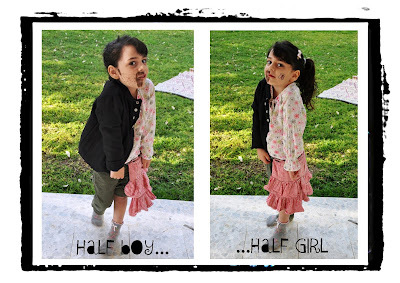 The girl decided to be a half-boy-half-girl. Perfect for her unique character. It actually was a very simple costume. I didn't sew or glue anything, just used safety pins to attach her clothes with the Big-Boy's. Then we just needed some hair and make-up job, and she was ready to go. Very cute ideas! I love the way the kids model their new clothes. The dress is fantastic as it flows so beautifully and is still modest! It is nice to see another mother who appears to focus on teaching children that their body is only for them, and one day their spouse. Bless you! I look forward to seeing more from you in the group! Thanks, I just did. Love your blog, I'm following you now through Bloglovin'. This is so cute! Love the popcorn costume! Thank you so much for linking up. Hope to see more from you on my next linky party. Thanks for visiting my blog and for your kind words! cute! The half boy half girl is really clever!